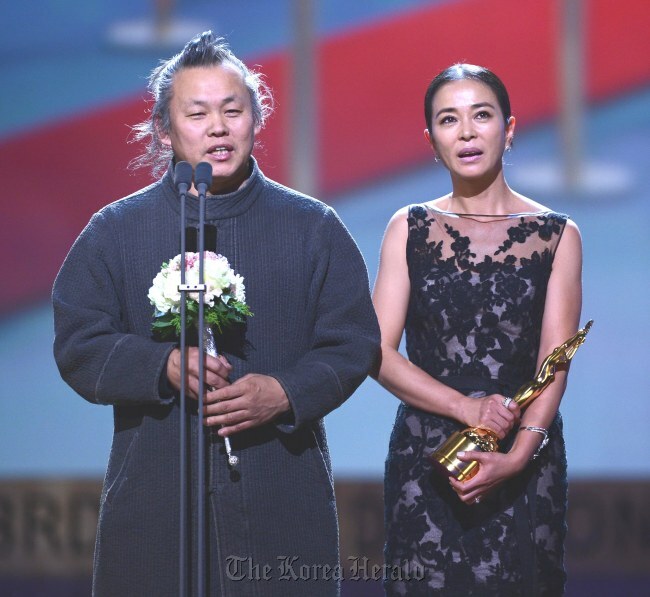 Director Kim Ki-duk’s Venice-winning film “Pieta” won the top prize at the 33rd Blue Dragon Film Awards on Friday. “I wanted to talk about capitalism and its problems with this movie,” said Kim after receiving the Best Picture prize during the ceremony held at the Sejong Center in Seoul. The film, a bleak morality tale about a cruel debt collector running into a woman who claims to be his mother, won the top prize at Venice International Film Festival in September. Kim became the first Korean director to receive the honor. In October, Kim walked out of the Daejong Film Awards, Korea’s Oscars, in the middle of the ceremony as CJ E&M’s box office triumph “Gwanghae: the Man Who Became the King” swept 15 awards, including best picture, best director, and best actor. “Pieta” had been nominated for six awards at the time, including best director and best picture, but only received the best actress prize. The director left the venue before his name was announced as the winner of a special jury prize. Kim, who has long been considered an outsider in the local film industry, spent many years as a factory mechanic in Korea and a street painter in Paris before making his debut with “Crocodile” in 1996. He won the Best Director award at the Berlin International Film Festival for his 2004 drama “Samaritan Girl,” and won the equivalent prize at Venice for “3-Iron” in the same year. “Pieta” is Kim’s 18th feature-length film, featuring actress Cho Min-soo and actor Lee Jung-jin. Kim shot the film in 10 days with a production cost of 100 million won. The film has drawn 603,096 viewers since its release in local theaters, according to Korea Film Council.